Philadelphia, Museum of Art, from September 30, 2007 to January 6, 2008. The exhibition was previously shown in London, National Gallery, from February 21 to May 20, 2007 and Ottawa, National Gallery of Canada, from June 8 to September 9, 2007. 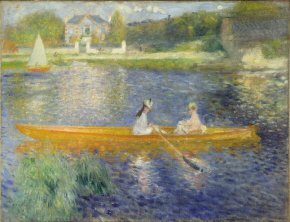 In a very understated setting, the National Gallery in London (where we viewed this exhibit) welcomed about sixty Renoir landscapes displayed in strict chronological order. The works belong to the period from 1865-1883, allowing the visitor to see how Renoir frees himself progressively from the Courbet model and finds his own personal style (or styles). This demonstration is interrupted in 1883, once Renoir had assimilated the experiences acquired from his trip to Italy, undertaken between 1881-1882, and his contact with Raphael. Afterwards, he would enter his period of Great Bathers in the style of Ingres, where line takes precedence over color and figures over landscape in the painter’s production. This period corresponds also to the end of Impressionism as an organized movement with regular exhibits (the last one took place in 1886, but few “historic” members participated). The four taupe-gray galleries of this London institution bring to life the major milestones in the stylistic evolution of Renoir’s painting, and through it, recount the early history of Impressionist painting. A follower of Courbet and the Fontainebleau school at the beginning (Jules Lecoeur and His Dogs in the Forest of Fontainebleau, 1866, Museu de Arte de São Paulo), Renoir quickly found his path in his contacts with Monet, with whom he would paint outdoors. The period of La Grenouillère in l869, is fundamental, and one of the points of major interest in the exhibit is the chance to compare Monet’s work, held at the National Gallery, and Renoir’s, from the Nationalmuseum in Stockholm, hanging side by side, painted at the same time and with the same subject. Whereas Monet is more concise and drawn to the plastic aspects of the subject, Renoir, who sees himself as a “peintre de figures”, paints a scene where the characters continuously interact : for the artist, the landscape is “sociabilisant” (View of Bougival, 1873, Milwaukee Art Museum). 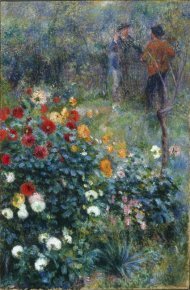 The human figure is rarely absent from Renoir’s landscapes ; it is often integrated into a benevolent and sunny nature, associated with vacation and other pleasures. It is in his ability to render the quality of light and the texture of air that Renoir best reveals his talent : L’Abreuvoir (1873, private collection) is a supreme variation on greens and golden browns, where the painter seems to make the spectator feel the wind blowing through the tall grass. Garden in the Rue Cortot, Montmartre (ill. 3), in an unusual format, is a luxuriant, even, in the words of one of the exhibit’s commissioners, Colin B. Bailey, a “Warholian” explosion of colors on the floral theme. Here, Renoir’s multiple styles are amazing : from a light touch to a thick paste, from earthy colors to acid tones, the artist seems to be playing with all of painting’s different expressions. On or around 1880, the compositions and the color associations become more complex (Landscape at Wargemont, 1879, Toledo Museum of Art), to reach an apex of energy in the Northern African landscapes (Le Ravin de la femme sauvage, 1881, Paris, Musée d’Orsay), where, thirty years before Matisse, Renoir feels the shock of the Mediterranean light and colors. His visit to Cezanne, at Estaque, provides even more force to his painting, and before a preordained return to classicism at the end of the l880’s, Renoir sometimes thickens his paste which he applies liberally to the canvas (The Wave, 1882, Memphis, Dixon Gallery and Gardens). 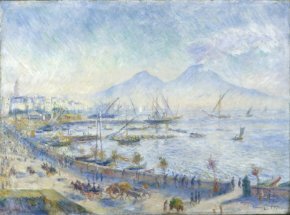 Elsewhere, however, his touch is translucid and the pastel colors evoke those of the future neo-Impressionists (The Bay of Naples (morning) ; ill. 4). In The Piazza San Marco, Venice (1881, Minneapolis Institute of Arts), the shapes are irradiated by a ruthless light, the acid colors are totally arbitrary. 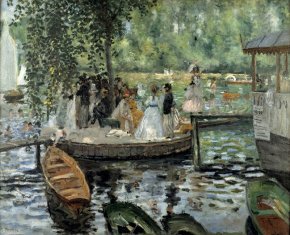 It is this violence of feeling, much stronger in Renoir’s landscapes than in his often affected portraits of bourgeois society, that confronts us at the exhibit of the National Gallery. Renoir’s landscapes 1865-1883, coedition National Gallery, Londres, et 5 continents, Milan, 2007, 304 p., 60 €. ISBN : 88-7439-373-3.